Ooh! 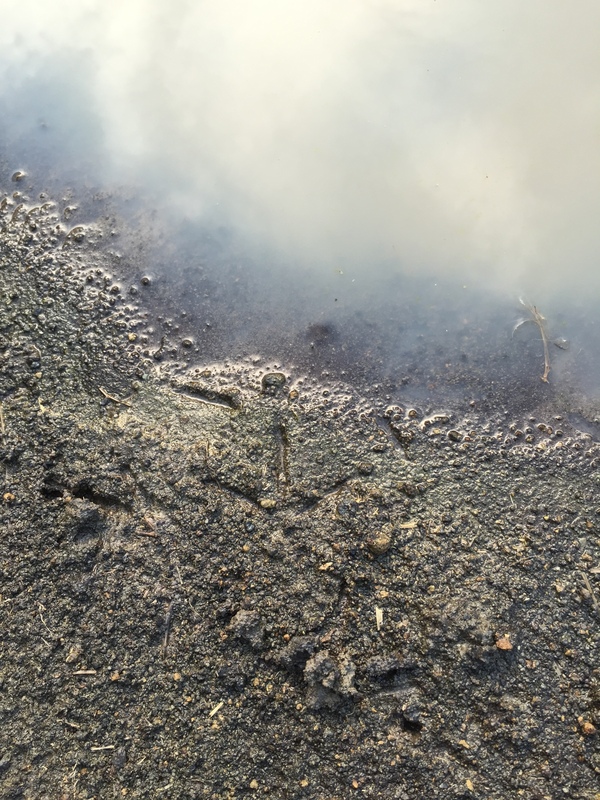 It’s a bird footprint in our pond! It hasn’t rained enough yet for the pond to fill up. So far, it’s just a big puddle. But that’s enough to arouse the interest of the local birds. This is probably the footprint of some kind of rail. As soon as the pond was completed, it was immediately checked out by a Spotted Dove, Long-tailed Shrikes and a Grassbird. Our caretaker Picio says he has seen Philippine Ducks scoping out the area and even landing there! Picio is pretty reliable with bird info. His eyesight is extremely sharp! He can spot things that I don’t see. 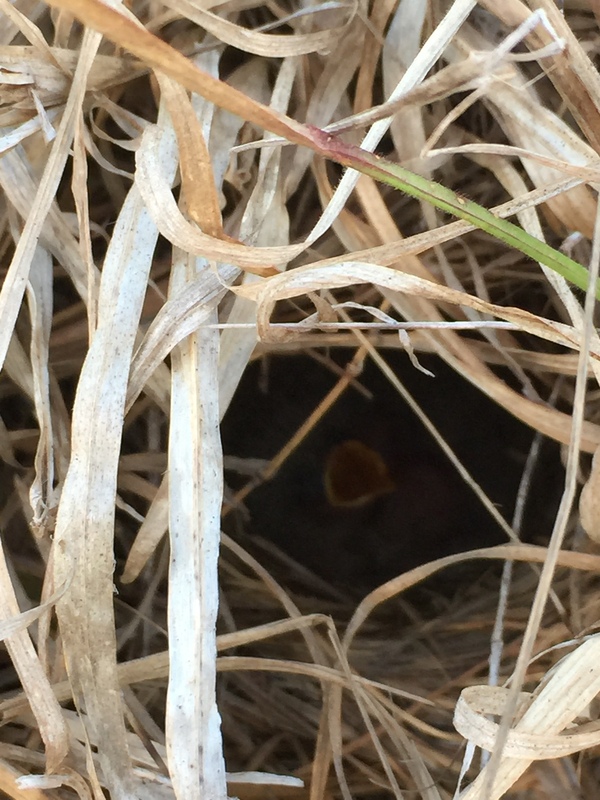 Like this tiny baby pipit in a hole in the grass. We were walking from the pond back to the house when he took a sudden sidestep to avoid crushing this nest hidden in the grass. And so we wait for the rain that will fill up the pond and bring in the cooler weather. In the meantime, we bought more seedlings to plant when it starts raining regularly. We went back to Talisay, Batangas where there are a lot of trees for sale by the side of the main road. We stopped by one of them and found out that they have a huge, very impressive nursery a short drive away from the main road. They had the usual trees that are popular for tree farming like mahogany and gmelina, the ones popular for landscaping, and also some native trees like the agoho in the photo. Only the camachile is “new” to our place. We already have mulawin and kamagong. Camachile is not native. It is an introduced species, and very thorny to boot. But it is also one of those very birdy trees. Birds like it a lot! I once spent many hours beside a camachile tree in Laoag while we were waiting for a Mandarin Duck to show up and I was amazed at the variety of birds that came and perched on the camachile tree. narra – might be good to have narra from different sources? banaba – cute purple flowers! Hi good morning. I also want to buy other fruit bearing trees like lipote, catmon, batwan, Pulasan, Hagis, Galo, kalumpit, biasong and many more, I still have to complete my list of fruit bearing trees. I I bought all my seedlings from Sir Zac Sarian, and sometimes, I go to QC Memorial Circle and Centris to look for other varieties. Thanks for being such an inspiration to everyone who loves gardening and farming. We’re not as lucky as you are with a huge lot to plant everything that you want. That’s why I only collect plants that’s in my priority list. Keep on posting, thank you. Hi Sylvia, sorry I wasn’t able to reply about the link for the farm I’m running in Antipolo. Anyway, we’re Ani Farm on facebook. 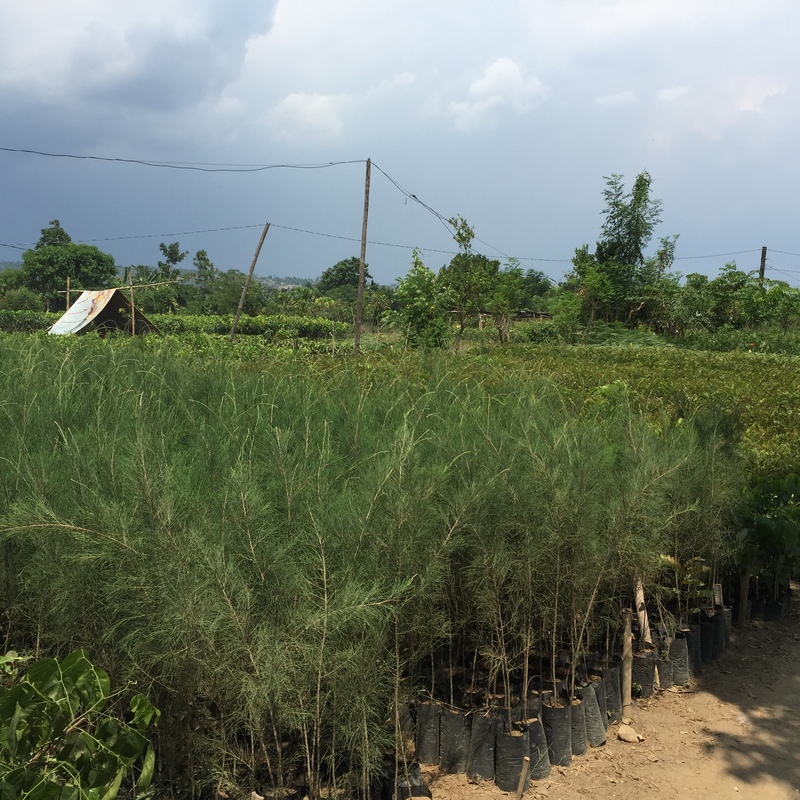 By the way, I was able to get native trees from a forester Remelyn Napay with a nursery in Tanay, Rizal. Was able to get pioneer trees like kupang, kalumpit, bani and narra for 15 pesos/ea while dipterocarps such as white lauan and tanguile go for 20/ea. You can reach Remelyn Napay at 0908-6215843. Did you have any success with the Aeta-run nursery in Bataan? Cos I’m still hoping to get more species than the 10-15 I currently have. Also, the weather in Bataan if it’s lowland could be a lot similar than the dry climate we get at Upper Antipolo, Rizal. Again, thanks for coming up with such a wonderful blog. Wish you all the best and happy tree hunting. Hi Audi, thank you for the info! We are going to Bataan this week to talk to the Aeta forester. We want him to set up a nursery for us in Batangas. If all goes well, we will be able to supply good quality forest tree seedlings to other people who want to plant native trees. Will also see if he has seedlings that are ready for planting. You want a putat near your pond!! Barringtonia acutangula or B. racemosa. I’ll get you some seedlings. Thank you Gina! That would be great! I would like to donate some narra seedlings from our arboretum in Pangasinan. Please email me your address in Manila. That’s very generous of you. Thanks! Next Next post: Here They Come!